Are you having trouble getting Flash content to load on websites? Google's most recent update to their Chrome browser - version 69 - has drastically changed the way Flash permissions are handled in the browser. Since this update, you will no longer be able to save Flash Player settings within the browser so you need to give permission again. Go With The Pro are the only GoNoodle activities affected by this Google Chrome update. 1. Click on the Lock icon near the upper left corner of the screen to open the site setting menu. 2. Choose Allow from the dropdown next to the word Flash. 3. Click the x on this small window. 4. Click the Circle Arrow Icon next to the Lock icon to reload the page to apply the updated Flash setting. Note: You will have to complete these same steps every time you open the browser. Each time you close or restart the browser (i.e. 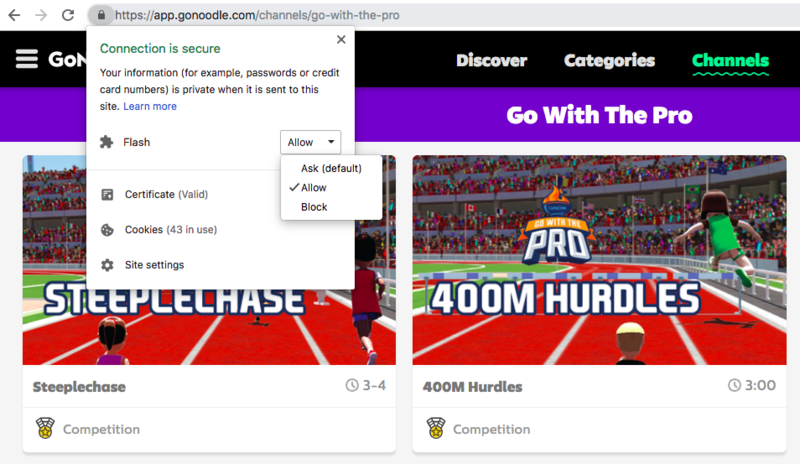 at the start or end of your school day), you will need to enable flash again should you wish to play Go With The Pro activities.